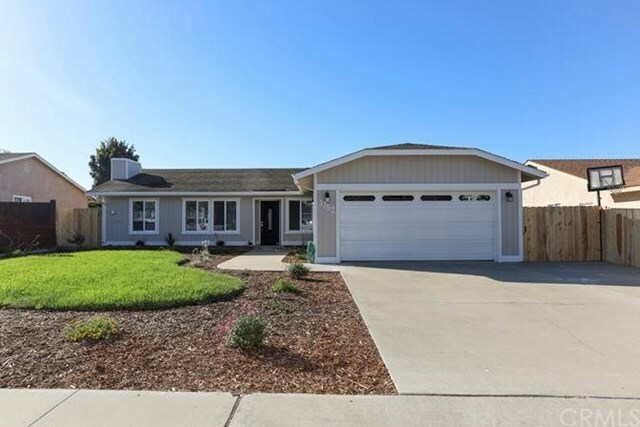 Beautiful Grover Beach 3 bed/2 bath single level residence, newly renovated and move-in ready. Featuring an efficient and livable open floor plan with wood burning fireplace, an abundance of natural light, and conveniently located near the beach, shopping and restaurants. The kitchen remodel includes new custom maple-cognac soft close cabinetry with granite counter tops, new stainless steel appliances, stylish single bowl scratch-resistant Kohler sink and faucet, and recessed lighting. Both bathroom remodels include new soft close cabinetry with granite counter tops, tastefully designed tile to showcase the brushed nickel fixtures, gorgeous custom mirrors and elegant new lighting. The interior renovation introduces a feeling of spaciousness and relaxation, boasting rich, upscale 100% waterproof laminate flooring accented by soft-colored interior paint and attractive new lighting and ceiling fans. The exterior renovation entails a neutral paint scheme complimented by an elegant front door, new fencing and water wise landscaping in the front and back yards with new sprinkler system. Attractive exterior lighting and RV parking nicely accommodates the outdoor space. Directions: Grand Avenue to Oak Park, south on Oak Park to Seabright.